Well done to Jane Ashbrook from everyone at Helsby for finishing 11th in her category at the Great North Run as well as earning lots of money for charity! Wirral Multi-Terrain Race 3 Results have now been published. On what was a glorious evening, surprisingly mild and not as windy as previous years although numbers were slightly down for green vests, luckily effort wasn’t. A tough race with all that sand to contend with (about 3 miles in total) and what feels like an endless run in to the finish, it was a good job help was at hand with Joe and Mario spurring everyone on. One race to go in the series, which is at Arrowe Park on Tuesday, another 6.30pm start and what will be a roughly 5-mile run through trail and woods and grass. Food and awards follow the race. Just click on Race 3 Results and current standings for the latest information. 8 green vests were on show for Helsby in a laid back village fete, on what was a drizzly and wet morning that turned into a near blue sky for the race. Some solid competition lined up at the start including the dogged and determined Pennine runners and those with the local knowledge Glossopdale Harriers. What could Helsby offer against such staunch opposition except the simple joy of running up hills! Joe was already out on the course choosing his best position for maximum vocal range, as the runners began what is a fairly short fell race at 5.5 miles. Although not a huge climb it is still a tough course due to it being runnable with a long steady climb. Total ascent of the course is roughly 1050ft. Danny was already out in front but chased closely all the way by a strong Holmfirth runner. The rest of the Helsby pack were chasing hard. With Joe’s cheers near the end of the race just what Danny needed to edge the race with a win by two seconds, three other Helsby runners worked hard to place in the top 20. It was going to be a close call with Pennine for the team prize. Luckily Helsby achieved it by one point, or in real terms, one position. Well done everybody and for Helsby this is something to be very proud of. Each team member received an interesting t-shirt…..you’ll have to ask! as well as some cans of Foster. We’d hit the big time for sure. Danny was not the only winner as Robbie Webster continued his excellent prize winning form to finish first in his age category. Quick update from Mario: 9 ran at Harrison Drive tonight. You can see how you compare to friends or other runners or see if you are improving! Please find attached the results for the second Wirral Multi-Terrain Race held last Tuesday at Wirral Country Park, Thurstaston. Link shows latest results for Race 2 and also current standings. A windy prospect on the beach and some long straights of the Wirral Way did not deter the 14 runners as performances below show. With seven Helsby runners and over 200 runners in total it was a good showing by the green shirts. Ian Landucci is hitting a rich vein of form for a new PB and fast improving Alex hit his first sub 40 10k, the first of many I think! Thanks to Joe, Janet Shaw and Hannah for plenty of support at different locations on the race. Special congratulations also goes to Alison Meakin who won a prize for 1st place in her age category. Back for more! The same stalwart crew were out last night, plus three more willing victims. Sadly Geoff was out with an eye infection, but was there in much appreciated support. We also had turn-outs from Phil, Vanessa and (small drum roll) Helen Moss …in her very first race in a Helsby vest. Well done! Hope you’ll be back for more. Another small drum roll for Adair, who was pleased as anyone to get 5th place overall. A fine achievement in such strong competition. Next week is Harrison Drive, Wallasey (by the Derby Pool, Bay View Drive). Note the 6:30 start. For anyone wavering these runs are tremendous fun, with all abilities. For anyone tight (like me) these races are only a pound! A rainy day turned into a blue sky for the first of this September’s MT Series Race held at Royden Park. A great atmosphere saw over 200 runners participate in this woody trail race at Thurstaston which included the highest number of fresh faced and keen Helsby runners for many a year. Individual and team placings extrapolated below. Many thanks also to Mario for sorting the finishing sheets and collection of coinage plus support and also to Joe (who was more than thrilled to see the charge of Helsby green vests) as well as the stunning view from the top of the sandstone at Thurstaston. The next race is on Tuesday evening at 7.00pm with the cost of £1 and is at Station Road, Wirral Country Park, Thurstaston. Be great to see even more of you there, in what will be an interesting race on trail and on sand. Jackie writes: Having read Andy’s Sandstone Trail challenge, I feel the need to put pen to paper to share my recent day out! 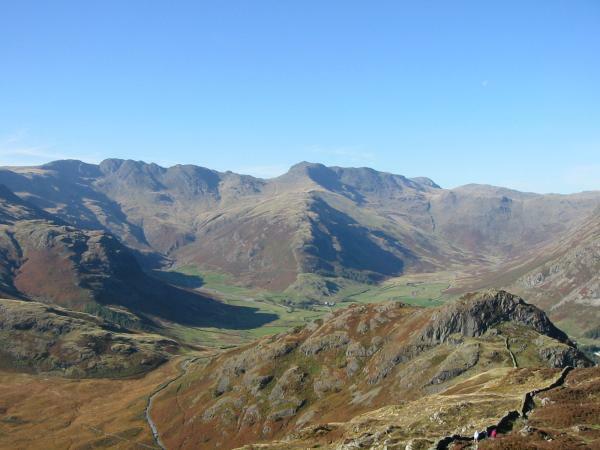 For a number of years now I’ve contemplated attempting the Langdale Skyline round. Last month I finally completed it; it was such an excellent day out I feel it is worth sharing and laying down the challenge for anyone else who fancies an excellent high level day out on the Lakeland Fells. The round was put to me a number of years ago now by 94 year Jack Emery who lives in Chapel Stile. Jack made it up and completed it in his late 70s. Early one clear summer morning he left his house by the back door, climbed up Silver Howe and did the high level traverse of the whole Langdale valley taking in Blea Rigg, Sergeant Man, Pavey Ark, Harrison Stickle, Loft Crag, Pike O Stickle, Rossett Pike, Esk Pike, Bowfell, Crinkle Crags, Pike O Blisco, Side Pike, Lingmoor down to the Chapel Stile and in through the front door to an awaiting beer and sustenance! That’s 30k and 8000′ climbing. Jack tells me he walked in in 9 hours. A little bit more about Jack first. Born in the early 1900s, he was a mile sprinter in the days of Eric Lidell and Sydney Wooderson. In 1939 he held the English 2 mile and 3 miles records of 9:03:4 and 14:08:0 (see attached); records which are still very impressive today! I’m sure we would have heard the name if it wasn’t for the 2nd World War which put an end to Olympic and Commonweath games in 1940 and 1944, when he was running at his peak. Since then he has had an active live running, walking and climbing; he completed the Annapurna Circuit in his 80th year! Having done all the mountain training for the 3 Peaks Yacht Race earlier this summer, I knew this was my best chance of completing and enjoying the round. The forecast for last Sunday was fine, warm and sunny (for a change) and we were up in the south lakes anyway. So Sunday saw me slogging up to Silver Howe in sweltering heat even at 9:30 in the morning. It was so hot I wondered whether it was a wise thing to attempt; however once on the ridge there was a slight breeze which made life a little easier and the streams I crossed were flowing with clean water for cooling (buffs are brilliant) and drinking, all essential. I took it easy on the ups (i.e. walked) and jogged the flats and downs. Once on Sergeant Man, its fairly high level and the tops are picked up fairly quickly. Its a long stretch down to Stake Pass and a flog up litle visited Rossett Pike. Down to Angle Tarn and then I took a short cut, going straight up to Ore Gap, from where I went out and back up Esk Pike. Then onto Bowfell where Bill met me with food and drink. A luxury 10 minute break before the rocky path down to Three Tarns and onto the Crinkles. Avoided the Bad Step (did not fancy it alone when tiring) and then enjoyed a long grassish run down to Red Tarn. Short sharp up to Pike O Blisco. Took another breather helping a couple with a crag fast black labrador all of whom were panicking. 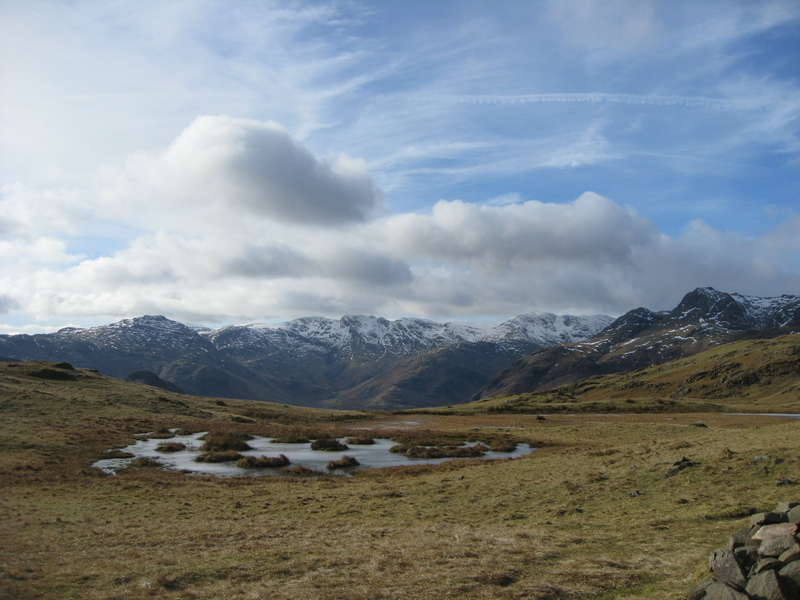 Crossed the tarmac (first of the day) at Blea Tarn and on up Side Pike, through Fat Man’s Agony finally onto Lingmoor. Fortunately its a lovely grassy run off (if you take the miners’ track). Finally the drop off to the main valley to meet up with Bill sat waiting in the camp site. He was sitting in the van for shade as it was so hot! Back at 6 pm, so an 8 1/2 hours round. Drank tons of liquid (orange) and then tea before heading home via the Sun Inn in Windermere to celebrate a brilliant dayout! So if any of you want a good day out in the Lakeland hills, either running, walking, or a mixture, I can throughly recommend this round on a fine sunny, but not too hot, day. If you need more details just ask and let me know so I can keep a list of completers! Jack Emery’s records, alongside other fascinating detail: 1950-extract.pdf (177k).